Food For Soul – Page 19 – A Positive Lifestyle Journal. They say once you have said something, you can no longer take it back. I guess it should be the same with words written (though editing is always an option, but it is not exactly how a pro does it). So here, via Zero to Hero, I’m now writing down the purpose of this blog for 2014. *This blog is about things I’m passionate about – coffee sharing, book reviews, things that inspired me, running stories and maybe a little bit about fashion that I cannot seem to get it out of my head. *It is both personal and out there for you, because knowledge learned, is more useful when we share it. If my words and sharing makes a slight different in your daily life, I would be deeply honoured. And, I’m always glad to hear from you. 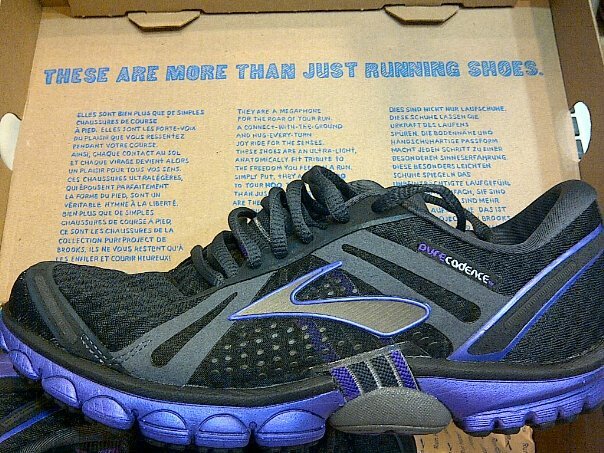 I have been having my pair of Brooks Cadence for a while, since early of the year when it landed in Malaysia. And the truth is, I have been wearing it for all my runs too. The only problem is, I always tell myself that I will write the review tomorrow, but it never happens with all my work and travelling around me. But today, during my run, I told myself that this is going to be the day I shall write an honest review of the shoe, simply because I have so much fun and enjoy wearing the Cadence for all my runs. Like all general consumers, I have had my fair share of trying all major brands of shoes, but those were the days in the gym that I could hardly tell the good from the great, but well, I can tell the bad from the good of course. Then a year ago, I met a bunch of runners who encourage me to run outdoor with them. That was how I started, from a mere 5km to 10km, and now slowly concurring the 15km, at least 2-3 times a week. That is when I realized; my pretty looking gym shoe is not going to cut it for me if I’m going to run outdoor so often. Of course I tried a few times before I confirmed the theory, because as a teenage athlete who did a range of sport from rhythmic gymnastic to Volleyball, I had my fair share of injuries, though they were not serious. The only one that I need to be careful is on my left ankle, which I twisted during my Volleyball days. Hence when I started to run seriously I find that my feet complains after each run. Then the runners recommended Brooks. I wasn’t sure but I gave it a try. My first pair was a good experience, and that is why I keep track of the new release of Brooks shoe. The ASR7 got me through various conditions from tar road to muddy field, and it is light enough for my liking, yet it never feels empty under my feet. When I first started I was still trying to discover my running style, therefore I was not ready to go for any minimalist style. The ASR7 gave me a solid ground to start. Slowly, I find that I would like to get another pair to alternate with, and it was the time of the release for Brooks Pure Project. I must say, Brooks Malaysia’s Consultant gave me a full mark customer service, and I really appreciate it. Coming from a retail background too, I find that it is truly difficult to recruit staffs like him. We spoke about running and he offered plenty of tips. This is passion about your work, and the Consultant is definitely passionate about running and providing good service. Initially through reviews I read, I wanted to get a pair of Connect. After I exchanged several emails with Brooks Malaysia’s Consultant, he mentioned he would bring a range for me to try. Came with a compact trolley with 8 boxes in it, the Consultant surprised me with the choices he brought for me to try. Ended up we both agreed for me to try the Cadence, due to the slight inward pronation of my right feet. And I picked the black-purple combination. I brought it to run the first time, but I had a pair of socks that is too thick for the shape of the Cadence. I was not familiar, and I yet to have a pair of running shoe that was in this fitting form. The next round I did better, and thereafter almost all the time I bring the Cadence with me. My ASR7 is now reserved for a specific muddy area that I go for run (I run on this area quite often too, and I love the grip the ASR7 gives on all those slippery areas!). The rest of the time I do with the Cadence. I even wear my Cadence daily when I went oversea for work trip, knowing that I need to walk an insane amount of steps everyday. In the morning, I went running with it, and after that I went to work with it too! The Cadence works perfectly for me and I love it. I was surprised that I did not feel any fatigue on my left ankle after an 11am-9pm walk! That is when I realized that I have found the right shoe for my ankle! I like how the Cadence hugged my feet nicely; not cutting in anywhere that it should not, and never comes into my way when I run. It feels light, but it has the balance comfort for the feet, and to me, the beautiful part of it, is that it gives me a light shockproof feeling when I run. The Cadence absorbs the hit when I landed. I feel less fatigue on my ankle and feet after I started wearing the Cadence, even when I try for a new longer distance. It is softly cushion for my ankle, and the well-balance comfort is definitely to my liking. I also like the support it gives me for my pronation issue, which the ASR7 did gives me too. But because the Cadence is so much more compact compared to the former, it feels even better, as if it is part of my feet and I no longer landed inward. I think I come to the important part: I feel no excess baggage when I run, I feel the Cadence is part of my feet, though it is not exactly a minimalist running shoe. It gives me the protection I needed; yet it never feels any extra. Additionally, both ASR7 and Cadence gives me good room width from side to side, as my feet is slightly wider than the normal standard, though with the small size (as compared to my height and built) feet I have. The ASR7 was the first time I feel my feet has room to breath, even when I choose a fitting size. The Cadence continue to provide the flexibility and comfort, even it hugged my feet tightly. That is just amazing. This morning when I ran with my Cadence, I consciously feel the response of my feet and my muscle during the journey, and as I leap forward every step, I was genuinely in love and happy to put another step forward. I feel hassle-free and therefore can concentrate better on other areas that I need to improve, instead of worrying about my feet and the poor ankle. I feel I can go further, challenge myself as I’m slowly improving on my running distance. The great thing is my left ankle complains a lot lesser (though not completely gone, I must be honest, as other conditions applied) than it used to, even when I am running a lot further than I used to, and I am very happy with it. Initially I was not sure if my ankle could take a half marathon, but now with the progress I am doing, plus the Cadence is proving that it could gives me enough support, I am ready to go for my preparation for 21km training on a weekly basis. You can imagine my happiness! Running to me, is never about anyone else, it is always about challenging my inner self. And I am glad it is progressing well! I am looking forward to the new summer color choices of the Brooks Pure Project, and I will definitely grab a new pair soon! Thank you Brooks, and thank you to Brooks Malaysia’s Consultant for such an amazing introduction to Brooks Pure Project. I could only look forward now! I was doing research for a potential client, and I somewhat landed on an NBA page. As a Chinese educated little girl, we did not learn English till the age of 7. The MJ I knew during my initial years was Michael Jordan, not Michael Jackson. Both black, both talented, both pour heart and soul into the field, but it was the MJ who did not sing got me goose bump all over. When I was young, we did not have satellite tv like how we have it now, where we can tune into live games any moment. Yet, I believed I know way more games, more stories, more stars back then, and of course, more die heart. That golden era of NBA, it was all about Air Jordan. Michael Jordan was such a star, those days, and even now. Of course great talents emerge in every era, and we’re glad to see that, but MJ gave us so much inspiration back then. Every boy in the school team wants to be MJ, everyone talks about MJ, the room was so quiet when we played the VCR. I genuinely admire MJ, and his dedication on something he truly loves. Everyone has talent, but ability takes hardwork. Persistency is not a talent, it is hardwork. Try, keep on trying. I can accept failure, but I cannot accept not trying. That is his famous saying. And I take it to heart from the very first time I heard it. Funny how after 15years, away from a die heart basketball games supporter, I relate to MJ’s quote more than ever. His quotes, are definitely for everyday life, didn’t they say, every game is like one life story? Either you take the beating or rise above and go head on with it. Winning or not is otherwise, at least you tried to detest fate. 2012 is the perfect time to say thank you. 2012 marks the new page for Matahari Select. You’ll see more of us in sharing the little stuffs that make my day beautiful and perfect. Here, ‘Perfect‘ as I named … Continue reading 2012 is the perfect time to say thank you.